Staghorn ferns are remarkable plants. They can be kept small, but if allowed to they will get genuinely huge and imposing. 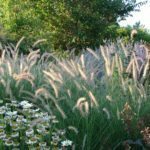 No matter their size, their interesting shape, which is made up of two distinctly different types of fronds, makes for a stunning conversation piece. But for all their good points, staghorn ferns can be a little tricky to grow. 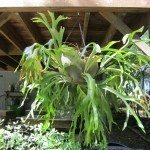 Getting enough light for a staghorn fern to grow properly is very important. 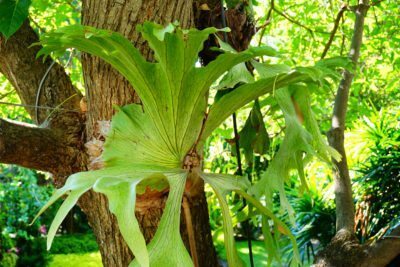 Keep reading to learn more about staghorn fern light requirements. 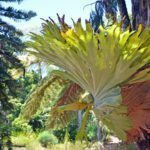 How Much Light Does a Staghorn Fern Need? In the wild, staghorn ferns grow in the nooks and crannies of trees in tropical forests. This means that they are adapted to the bright but dappled sunlight that filters down through the branches of the trees. You can recreate this setup easily by hanging your own staghorn fern outdoors on the trunk of a large tree. While dappled sunlight is good, staghorn ferns also do extremely well in bright, indirect light. This can be achieved best by placing the fern in a covered porch that has plenty of windows. The key is to expose the fern to lots of light, but to keep it out of the direct rays of the sun. A staghorn fern in full sun will get scorched. 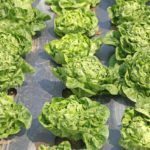 On the other hand, growing staghorn ferns in shade that is too dense will slow their growth considerably and encourage the growth of fungus and disease. Staghorn ferns are not frost hardy, so many gardeners grow them inside, at least in the winter. Indoors, the same rules hold true. Staghorn ferns need lots of bright but indirect or diffused sunlight. This is best achieved by placing them next to the brightest window in the house. All directions are fine, but west-facing windows might expose the fern to too much direct afternoon sun. Staghorn ferns can’t really survive with just ambient artificial light – they need to be near a window to stay healthy.